CAClase are the UK importer for the KVH Tracvision dome systems and are particularly wonderful when it comes to technical support and believe in taking the bull by the horns to get answers. As such they went on a whistle stop tour of key locations in France and Spain to find out for sure just where the footprint for Astra 2F really is. The team packed up their Mercedes Vito with an R4, R4sl, R5, R5sl, M7 (that's a big marine dome) a Travelvision R6 and a Megasat 85. There wasn't much space left in there with what must have looked like a giant mushroom farm in the back, but Simon and Justin managed to squeeze themselves in and set off on their Michael Palin style adventure. They drove over 2,500 miles in 4 days and used 344 litres of diesel with the masterpiece map below being what they have to show for it. Currently the main channels to have moved to Astra 2F are the Channel 5 family of channels, but eventually we expect all of the channels that were on Astra 2D, (that are temporarily on 1N) to move to 2F, 2E & 2G. Both 2E, 2F and 2G should have the same footprint and the migration is planned to be completed in the next 12 months or so. Our best guess at the moment is that the majority of free-to-air content will eventually reside on the UK beam and expect the majority of encrypted subscription content will be on the Pan Europe footprint; meaning coverage improvements for subscription channels which will no longer have the North/South split. At the time of the test 5 transponders were transmitting about 30 channels on the UK beam, including content from all main terrestrial channel providers. The bad news is that content on this satellite has a reduced footprint affecting users in Southern-most France and Northern Spain. 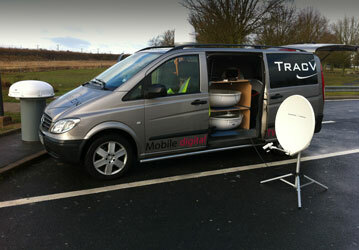 The good news is the signal inside the footprint is stronger, therefore, reducing the risk of rain fade and offers the opportunity to use smaller dish sizes within the UK. The extra capacity allows for regional variations of the HD content and further channels and services to be added in the future. With plans for a Europe beam to be added to the 2F satellites, as well as both UK and Europe beams on the forthcoming 2E and 2G satellites, we eagerly await to see what content gets allocated to which. CAClase are the UK importer for the KVH Tracvision dome systems and are who supply us with our dome systems. we are one of their main dealers and as such offer a 3 year warranty on any Tracvision system that we install.